Lock in a great price for Thebonairian – rated 8.3 by recent guests! Staff is very nice, beach is perfect, location is good: close to town. Decent internet speed. The location is great. It’s so close to the airport, many beaches and historical sites. The staff is extremely friendly and accomodating. We at at the restaurant for breakfast and lunch. Breakfast was hit or miss (we received under baked croissants twice) but lunch was fantastic. The view from the hotel and the lounging facilities are fantastic. All in all, I enjoyed my stay and would return. The Bonairian is decadent! We loved our stay. The views, pool and eating place are amazing! Perfect diving right out the front door. Can't say anything bad about this place other than we had to go home. The place is great private beach, friendly staff, recent remodel. Breakfast & Dinner good but a little expensive. Pool not heated but the ocean is right there. great terrace and beach access. Good Wifi. Great bar open to beach with ocean views. Sandy access to the water directly in front of our bungalow. Great staff, everybody friendly, charming place, beautiful location, good snorkeling right in front. We loved it. Location with a private beach was amazing. You can ask for snorkel gear and just walk in the ocean to the reef and see amazing water-life. The hotel is near the airport, but there is almost never air-traffic, you can see some small planes flying over. Outside setting on the sea, nice lounge area. Direct snorkling, diving from The beach. The room we had was fantastic. Big, beautiful view. 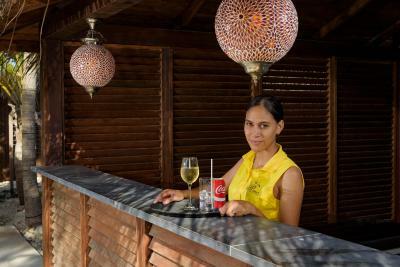 However the hotel is run by limited amount of staff. Especially the kitchen is run by 1 person. That means that it does not open in the morning on the time that is mentioned and you may sit for breakfast while there is no cook. The staff that is available at that time does not mention the absence of the cook. Thebonairian This rating is a reflection of how the property compares to the industry standard when it comes to price, facilities and services available. It's based on a self-evaluation by the property. Use this rating to help choose your stay! One of our top picks in Kralendijk.Located on a private stretch of beach, Summer Dreams Ocean Club offers an outdoor pool, a sun terrace and stylish rooms with sea and pool views. Flamingo International Airport is just a 2-minute drive away. 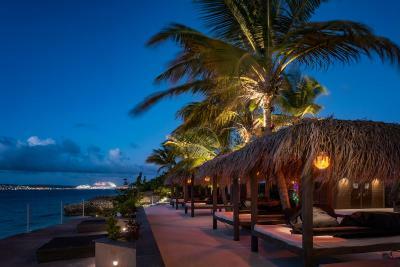 Summer Dreams Ocean Club features elegant contemporary décor, air conditioning and free WiFi. There is a restaurant, bar and seating area with cable TV. 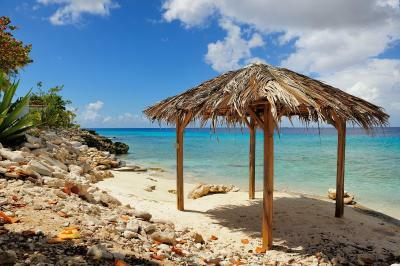 Bonaire is an ideal base for water sports, including windsurfing, diving and snorkeling. You can find popular diving spots within walking distance, while the center of Kralendijk town is a 5-minute drive away. When would you like to stay at Thebonairian? House Rules Thebonairian takes special requests – add in the next step! Thebonairian accepts these cards and reserves the right to temporarily hold an amount prior to arrival. Food is expensive (particularly breakfast) and our room was dark (Corner, garden-view room). The small staff at The Bonairian were lovely. They weren't overly attentive but always responsive and kind. We felt like we were at a cozy bed and breakfast and enjoyed the relaxed, local island vibe of the place. The location is very convenient and the property is beautiful. The food was good (albeit expensive). Breakfast is from 8-10:30, Lunch is from 12-3 and dinner is from 6-10pm. Don't expect tons of amenities but expect to have everything you need. The Bonairian is not ideal for divers as there are no facilities to clean your gear, but you can do that at the Dive Shops if you rent gear/tanks through Dive Friends (most convenient because they have several locations). There are places to at least hang your gear at the end of the day (on the ledge in front of your room). 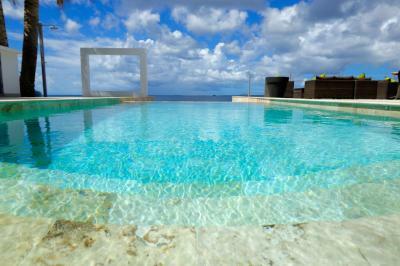 Overall, we loved our stay at the Bonairian and felt it was a great value. It is a quiet, small, family-owned place right on the water. We felt very safe and comfortable there. I think it is one of a kind as far as the island goes (not being a big resort or a dive hotel but still being on the water and having a nice restaurant). This is a gem of a find if you like boutique hotels. It only has 8 rooms and the property fronts beautiful ocean and has a small but nice sandy beach. You have fantastic snorkeling right from the property. Carlos the GM and staff are wonderful and made us feel very right at home. Our room was giant and even though we had a garden view - if you open the door you are looking at the ocean. We took a cab from the airport which is kind of a joke as it is SO close. We walked to the airport on our way home (during the day) but it's not advisable with a rolley at night as you have to roll it on the road. The adjacent beach to the property is also fabulous and then there is the Kite City food truck right there as well which is wonderful. We rented a scooter through the hotel and i highly suggest doing that. It was so fun and we could go to the grocery store and into town easily as well as all around the island. This is a special property. You will not be disappointed by staying here! 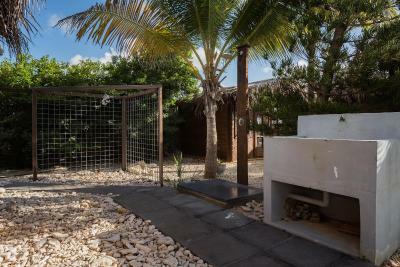 Best place to stay @ Bonaire! Room 1 with sea view is next to the kitchen, quite smelly, and constant people walking past the window so u need to keep your curtains closed making it a dark room. breakfast quite poor amd expensive. Rest of food not great. Hotel is very close to the airport. Be aware if you are sensitive to the noise (no scheduled night flights, tx). Our room is very small. A nespresso coffee machine in the room. The place was wonderful. Carlos the chef was the best host a hotel/restaurant can wish for. It was like home away from home but than in a luxe setting. I will surely return. Price too high for service: practically ho staff apart from the chef who has to do everything: cook, entertain, serve and follow the guest in his necessities. Even though Mr Carlos is vary handsome. Can’t think to pay almost $300 per night without breakfast ... . Breakfast (extra) was expensive and nothing at all. Excellent location, stunning, directly ON the sea. Underwhelming - the pool turned out to be smaller than in the photos and our garden view room was essentially in a container with flimsy doors. Not clean - there were stains on couch, bed and the table above the fridge. Shower pipe had not been drained so water clogged quickly. Our room looked out onto the terrace right where the bar is - so we closed our curtains for more privacy. Staff were indifferent to us being in the bar - non-existent service aside, the only times they talked to us was at check-in and then later in the day when one of the staff asked my partner rudely if we were actually staying there. Unfortunately I left an item of clothing in the room and despite my emails inquiring if it was there its been more than a week and I’ve yet to even receive a reply. Not worth the USD150/night rate. The hotel is a beachfront property but I cannot in good conscience recommend this place.